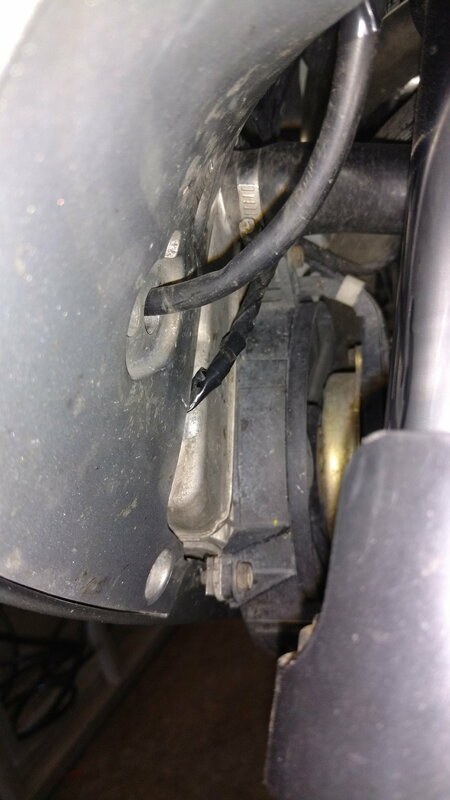 I had fairings off the other day, and during replacement noticed this wire that was being pinched against the right side radiator. Due to its length though it seems to be best placement. I did a quick electrical tape wrap because I had to ride, but would like allow for better clearance if I can. Photo attached. 1) I realized how filthy the bike was after taking the picture. A good wash is in order. 2) photo was taken facing the front of the bike. On the left side is the R radiator. The wire being pinched is seen at this spot.does this look normal? Last edited by 2.5i; 10-25-2017 at 03:10 AM. Reason: spelling.